Yes, time has stopped, well the busy period is over and I have some time to myself. Time to myself?? Haha, I get lots of time to myself, it’s just how I use it that matters. Seriously though, the Art Trail is done and everything is unpacked and put away, boxes ready to go for next market; more beads ordered, oh and the massive task of finishing my website. I have done a huge overall. Some things have stayed the same: colours, style and layout. I’m happy with that. But the menus have changed. I was talking with a lady in the near past and something she mentioned got me thinking. She said she liked ‘chunky and funky’ in relation to necklaces, and so the seed was sown. And then the work had to start. Re-doing things… Hate that. But sometimes, like now, it was easier to do over than hunt around and waste time. So all my jewellery is now organisd into style and the menu reflects that. Want something different, some glass or maybe a bit of bling for heading out onto the town… It’s all there, in separate menus. Loads of casual everyday wear, (my disclaimer is that it’s what I would wear everyday and so may not be wear where you expect it). My new range of knotties and polymer pendants get their own albums. Bags are organized the same. Wraptures are in a class of their own. Ears and fingers are together,although that will probably change as I add more earrings. Bracelets get a page to themselves. As I type this there are more items being uploaded on the laptop, so trying to multitask, but with a tiny laptop that is incredibly slow at times it is annoying… And I’m starting to feel weary – I did a big house cleaning yesterday as the last few weeks it has been neglected, must say though, I do feel better for it – and I’ve been going to bed later than normal this week. It seems to catch up quicker than it used to. Funny that. Where was I?? Cleaning I think.. So, the website is 90% done, and I’m gearing up for lots more markets in the coming months. And my desks are an absolute mess. Not just a mess. I only moved in here a fortnight ago, 3 weeks at the most, and I still haven’t got it sorted. So tomorrow is the day. One because I have lots of new beads arriving and if I am going to make more pieces and do some sewing/canvas art then I have to tidy up. Why do I find it so hard to keep things neat. Oh, I know being creative gives me some leeway, but really, this is just ridiculous. Even my coffee has gone cold. So I might hit the sack and see how it goes in the morning. (this week I can’t just jump in at 8.30 when the boys have left for school as the eldest has work experience and I have to drive him there, so it’s at least 9.30 before I can get started). I have my lists, I am a great list maker, love them. So my desks are 3/4 done. A little fine tuning tonight and then I’m set to go. So I didn’t get to do any canvas art, I did finish uploading a few things to the website though, which means it is done!!! As the picture will show, there is another wooden box with my stones. For wire wrapping (hmm, maybe not). Glass for wraptures and pendants, and a few loose beads for fun things. Then there is a pile of old earrings to sort through and jazz up and replace the ear wires on. A box of misc beads from every where. 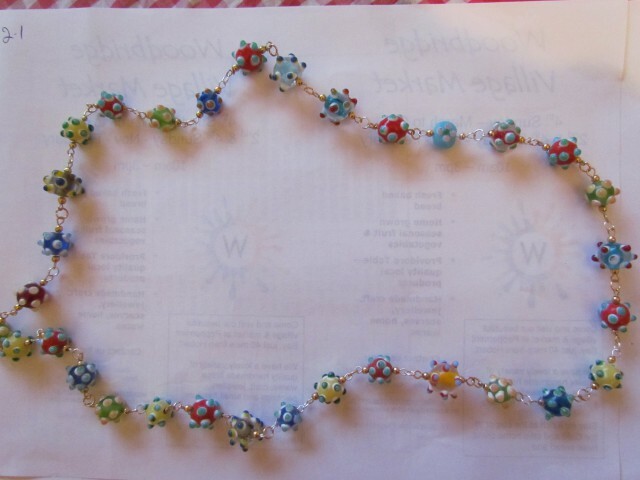 (the part I hate, sorting loose beads!) and then the box of stuff to revamp, pull apart, re make… Some of it I have had in limbo, some of it is old and just not had any lookers or compliments. Others are just pieces that will work with something else. My goal is to go through this box one at a time, when ever I get the urge to bead, I have to start with this box. Thats the idea anyway. Hubby arrives home tomorrow so I have to pack away a few items and make the place look halfway decent, and so I don’t lose/spoil anything. I am raring to go with new items. And next week I have to get onto more canvas. That’s number one. To weeks of school holidays and would you believe it, hubby is at work for all of it. So, aside from being the work taxi for mr 15/16 I have no where to go. 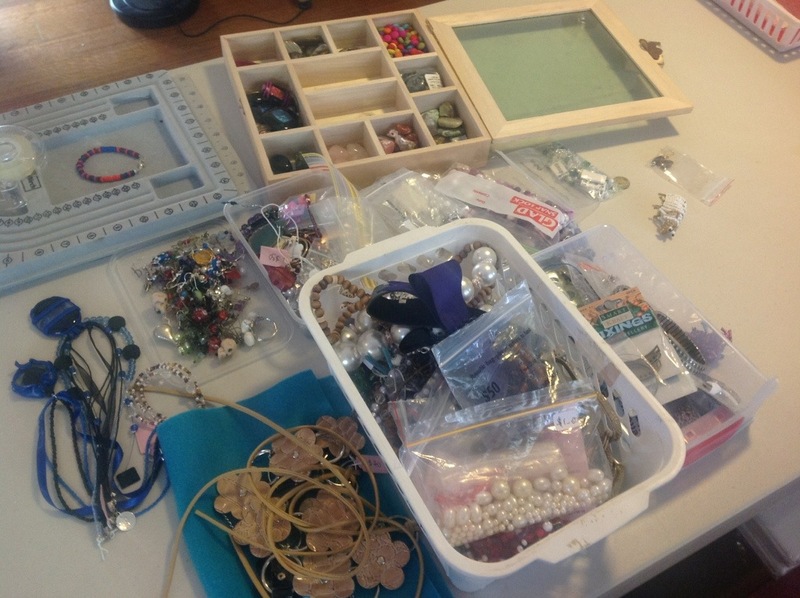 This entry was posted in Beading and tagged Beads, Cleaning, craft, organize chaos, space, tables, wire. Bookmark the permalink. ← A shed full of colour. A weekend of fun. Oh yes, I get distracted too easily. If one doesn’t work, I leave it and move on instead of packing up. I used to think that too. But now that I know lots of beaders, it is a curse of the craft. We are all the same! Thanks for telling me I am NORMAL been awhile since I was called that! I’d say you were very normal. Welcome back! !